One foot in front of the other. Thankfully the rain ceased overnight and the wind dropped considerably. When we all woke, which was early, given the long rest yesterday, the wind had virtually disappeared. As was bound to happen though, on gearing up for the day, it picked up again was people started to exit the hut and commence the day. No where near what we experienced yesterday but a stiff breeze carrying a chill through the air. There is nothing quite like putting on clammy, damp clothes on a cold morning. I’ll never get used to it, especially wet socks. Nothing dried overnight and there was no choice. I needed to keep my thermals packed well and dry, so damp everything it was. Once on though it didn’t take long for them to at least warm up with some body heat trapped beneath the shell layer. Merino clothing is awesome for retraining some warth when damp and I was thankful that I’d taken my Icebreaker’s along for the ride (un-apologetic sponsor plug, Icebreaker clothing is awesome). On leaving Nicols hut there was some cloud about but it looked to be breaking up. As we climbed from the hut to the main ridge line the wind was cold and I found I needed my gloves for the first time on this trip. Perhaps an indication of what the south island may bring and dually noted for my gear changes coming up in Wellington. 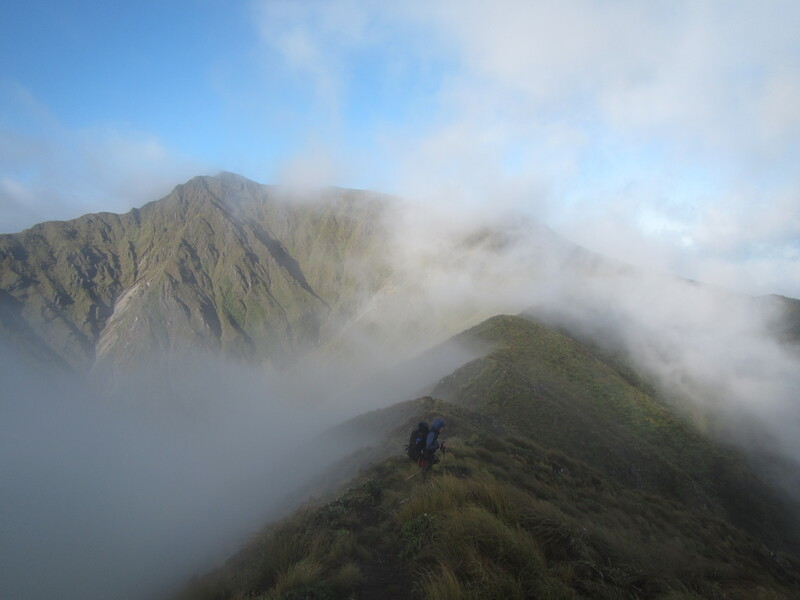 Views of the climb up the ridges to the summit of Mt Crawford came and went in the cloud. 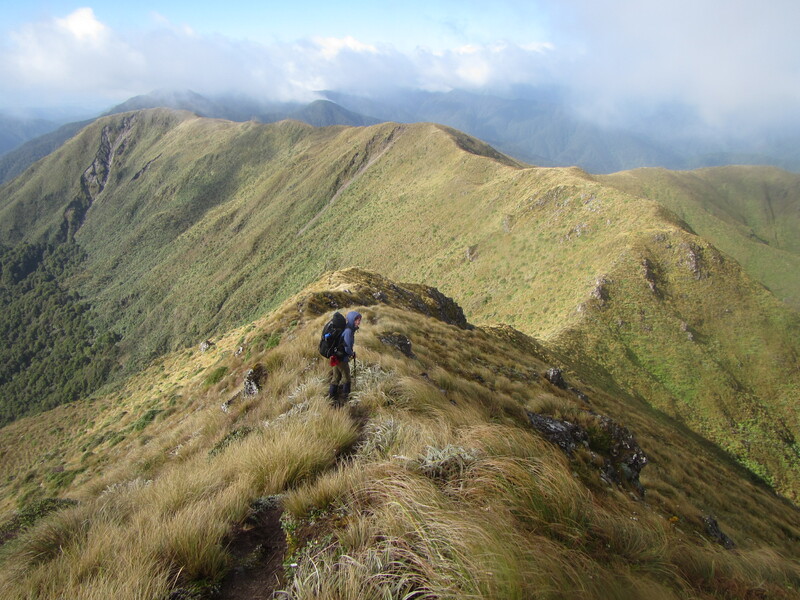 We had a long day ahead and were straight into it with the 200m climb up to Mt Crawford across exposed ground. The climb looked big viewing it from below but I found the trail climbed at a nice easy grade. Sometimes its hard to gauge such things, as everything looks big over here, and without anything to give perspective it all looks grand. Occasionally we could see the pairs of the other TAers silhouetted on the ridges and it became clear that the climb up wasn’t so bad after all. 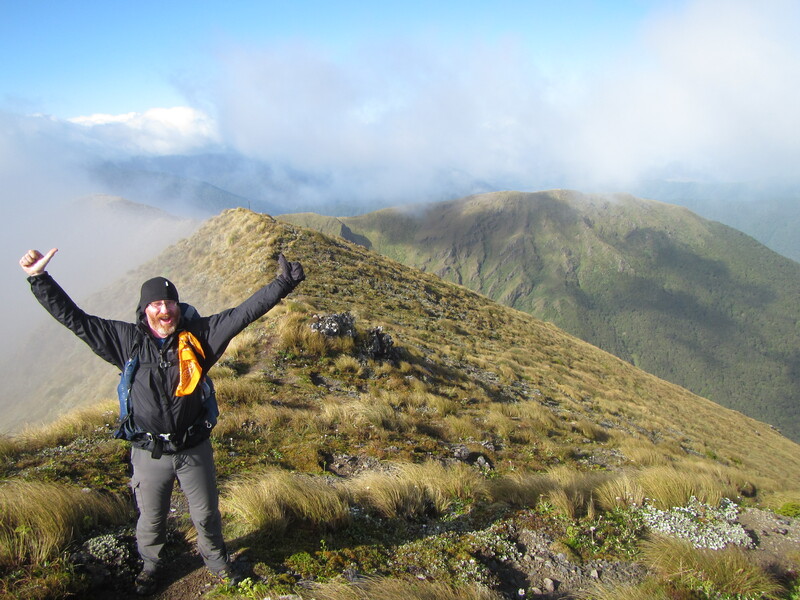 Battling the wind we made our way up, eventually topping out on the summit to stunning views down to the hut, across the main range and the ridge line we needed to follow down to the Otaki River. 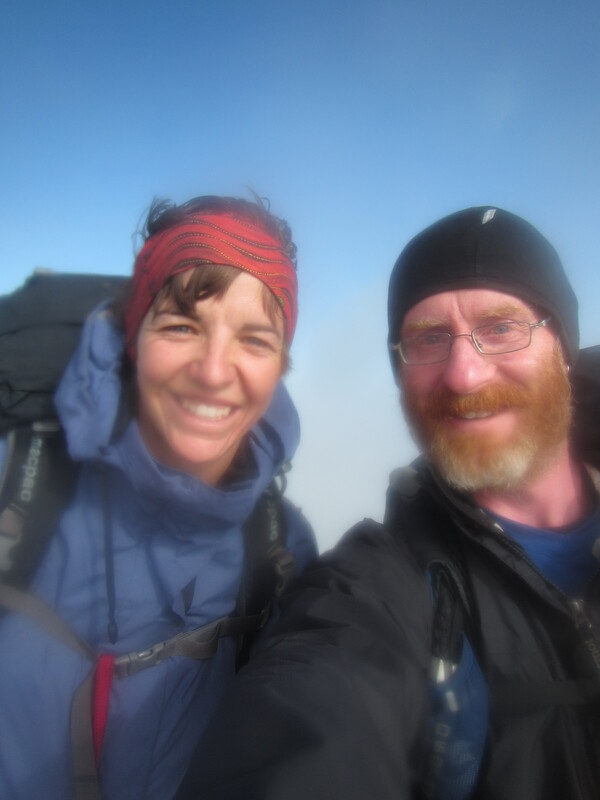 Of course we took the customary selfie on top and tucked into a snack to keep energy topped up but the wind was cold on the summit and was no place to linger for long. With sweat on the way up stopping for more than a few minutes was asking to be chilled. The views were grand and we could see McKayla and Shania about 15 minutes starting to descend. Now the climb down was going to be steep but I had no idea just how long and protracted it would be. A knee killer to be sure. We started down, entered back into the trees, took of shell layers and continued down and down and down. Forever it seemed. We had around 1000 metres to descend over 4 kilometres. It pained Sarah and brought back memories of Pirongia for me, although without the shin deep mud to content with. The grade was harsh. I can’t quite remember how long it took but somewhere close to 2.5 to 3 hours. By the time we reached the bottom of the valley we were both knackered. Walking along the flat of the river was heaven but short lived. We had a swing bridge to cross to get over the Otaki River and still had a ways to go to reach Waitewaewae Hut (pronounced YTYY) for lunch. How thankful we were to reach the hut. A pity we were not staying. I fell in love with YTYY Hut. The perfect little hut in a great location. I thought I could easily move in and live it. But the day wasnt over. We had continue on to reach the Otaki Forks. After lunch with McKayla (Hokey Pokey) and Shania (Slips) we had a look at the trail notes and they seemed to indicate that there was a lengthy section where the trail was in Saddle Creek itself. We were looking forward to this and it would give Sarah some exposure to all the different types of terrain that the Te Araroa traversed. But as it happened, on approaching the creek we ran into a trail sign indicating that there had been some major slips along the creek and we were to follow a newly cut track to get around this section to the south. This was the first any of us had heard about this and the new trail was not indicated on any maps we had. The hand written sign indicated Otaku forks was still another 3 hours away. Great. Just what we needed. The new track was a sidle track and was terrible. Over rough ground, rocks, longs and it climbed. We have no idea where it was going to take us other than eventually to Otaki. It took us uphill, down hill, across multiple streams and seemed to take forever. The bonus was that stream crossings were all great. Perfect little mountain streams with clear running water in shaded gullies. This section of trail was wearing thin on me and I could only imagine what Sarah was thinking. It had my cursing in multiple spots. Eventually it lead back to the original trail, a perfectly graded old tram track running on the contour. Surely the new trail could have brought us back onto this much earlier. Oh well. What is done is done. We had got through but it was turning out to be a big day and the most physically demanding day that Sarah has experienced. She confided that there was some major inner dialodge occuring along this section trail involving all of the swear words you can think of. Along the tram track we still had a good 3 km to reach our destination for the day Parawai Lodge. Not sure what the difference between a DOC hut and a lodge is. None it would seem. We resolved to smash it out and just get the day done with finding some reserve energy to put one foot in front of the other. It is amazing what the body can do. We walked fast on the tram track where it was flat. Passing some of the slip damage I could appreciate why a new track was cut. The slips were massive and would have washed away thousands of tonnes of soil. 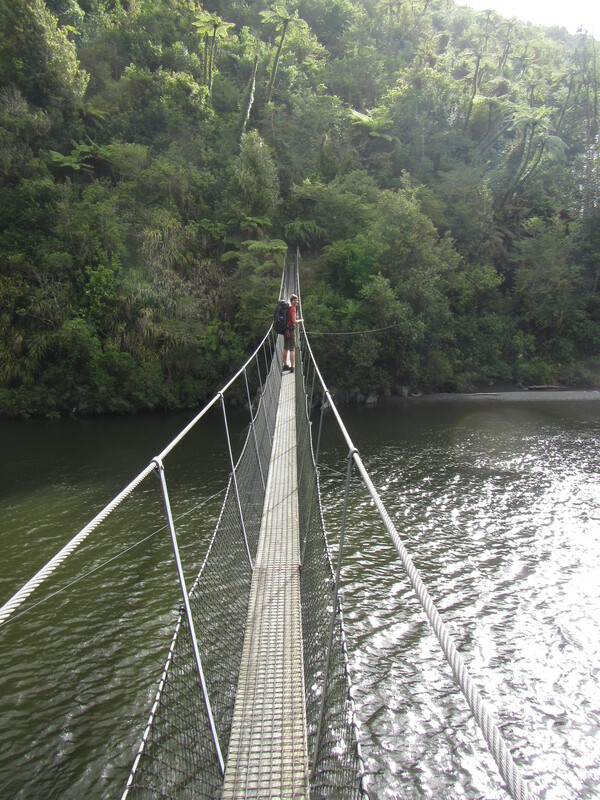 The final descent down to the river lead us to another swing bridge over the Otaki River again. From here we had another long kilometre to the hut. Glade to have the day over and done with. Phew!! The rock fall and unstable hillside has cramped everyones style. It happened mid Dec and is going to affect trampers until well into Feb it seems. It is disturbing that the information for TA walkers is not better. Don and I were hoping to walk into the Waitewaewae Hut this summer too – as well as our over-nighter into the Waiopehu Hut. It really is a a sensational hut and a magnificently scenic spot. I spent 3 very memorable days in there with a friend years ago now. Us two Mothers took four 8 -10 yr old boys with us on this adventure and had a lovely time. Now grown men, our sons and their friends, they still talk about this trip. Day 124: Invercargill to Bluff!!! Day 17: Ngunguru to Pataua. My hostel room covered with food and boxes. My Into the Wild magic bus moment.